Comment: Over 6 Million items sold. Fast dispatch and delivery. Excellent Customer Feedback. Over 6 Million items sold. Fast dispatch and delivery. Excellent Customer Feedback. Initiallly published in 1968, this text is regarded as a revolutionary work for its depiction of a planet made ever smaller by new technologies. A mosaic of pointed insights and probes, this text predicts a world without centres or boundaries. It illustrates how the electronic information travelling around the globe at the speed of light has eroded the rules of the linnear, literate world. No longer can there be fixed positions or goals. 5.0 out of 5 starsIs Your Brain OK or KO? Media theorist Marshall McLuhan does a double take on the Massage by doubling his informative view of the media world splicing effect after effect after effect. Beginning locally in the village of small tribal cultures of oratory dominance demonstrating the break of the sensorium which created a tactile society. Moving through history as if fragmented in its own way recapitulating the effects of media which broke up the senses and amputated the limbs of our physical and psychical systems. Although written in 1968, McLuhan moves right into the present times understanding first, electricity as extension of the nervous system and lucidly stating that LSD, the psychedelics of the past are equal in effects to the modern day computer as a recomposure of our being. From our computer realities, one can easily define theirs as an integrated inter-net, linking one another through digital media that is light speed. McLuhan understood the implications of Einsteinian-ENIAC models of the world and distupted the passive television view with this commercial interuption to wake up the senses. Reccomended for McLuhan lovers and those who are still watching TV on a regular basis. This is a stunning brilliant book. Much of it could be written today and still be presciently insightful. It is astounding that this was published in 1967. For everyone and anyone interested in social media, the digital environment this is full of insight. Highly recommend this book. I actually have a copy of War and Peace in the Global Village from when I was in college (back in the early seventies) however the binding was falling apart. I've become a McLuhan fan through the years mainly due to the fact that I find him more and more correct on what he said about the media back in the sixties. I find that his arguments and thoughts have stood the test of time and I would have to say that his forecasts, though I don't believe that was his intent have proven more correct than any of the forecasts I read that were published in the same era as McLuhan. It seems that many people are put off by the design of this book as well as his more famous title, "The Medium is the Massage" though for me that's part of why I like the book. It is what makes the book contemporary and bold for me. As a graphic designer I may enjoy this book all the more because of the visual treatment along with the quotes from "Finnegan's Wake". Perhaps this book and "The Medium is the Massage" could be considered the beginning of the graphic novel as well. I would have to study that more however since I am not that familiar with graphic novel history. Also, I do not consider this a fiction book. This classic, WAR & PEACE, attempts to awaken the reader to the realities of media that lie hidden in his own mind. These realities are composed of the everything in the current "electric world," of signs, of real words and nonsense sounds, of pictures, of stuff, of technologies, of clothes, of weapons, of food, and of chemicals, all of which McLuhan calls media and the extensions of man. Can the reader who knows nothing of the pre-electric world be awakened to perceive it? A difficult question since there are all kinds of readers from the primitive to the scientist to the computer programmer. 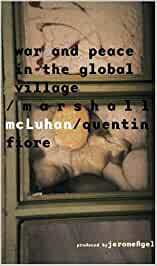 Indeed, McLuhan and Fiore take the reader on a impossible journey into the guts and gear works of the human brain. Did the Authors bridge any gaps or just create new, unknown ones? Everything about this book is difficult. This includes the often obscure passages on every other page from Joyce's FINNEGANS WAKE. The Authors advance the notion that all behavior, war and violence, stems from man's search for his identity. "So that today war, as it were, has become the little Red Schoolhouse of the global village."(P. 125) War has become the educator and education becomes war. "No one has studied what degree of innovation is required to shatter the self image of a man or a society." And how can man understand himself when he is always engaged in "rearview mirrorism?" Man looks backward because he can't see forward. In addition, all the media surrounding man is merely raw material for man's info processor, his brain. Thus man is hooked on his current media like a drug addict is hooked on that which alters his sensual input. Man, himself, is but a collection of information. Immersed in this sea of info, like a fish in water, how can man sort out those bits that beg for priority? By understanding the info that composes himself, can man escape his own senses, those that compose and shape his every move? One doubts it! McLuhan is a must read for anyone interested in the unfolding digital environment. For this book, here's a wonderful quote that makes reading this book fundamental "It may be simplest to say ... that the real use of the computer is not to reduce staff or costs, or to speed up or smooth out anything that has been going on, its true function is to program and orchestrate terrestrial and galactic environments and energies in a harmonious way." As we enter the age of climate change and the implied terra-forming that we will have to enact to engage with our own evolution McLuhan say beyond what most still cannot fathom as our common horizon. Highly recommended. The funny thing about Marshall McLuhan is that whenever you read one of his chapters, you're never really sure just what he said - though he described it in a way that seems enlightened, meaningful and cogent to our times. I find myself falling back, re-reading the chapter again always feeling a bit off kilter. That said, War and Peace In the Global Village does one thing well - it makes you think - and think at a higher level about our culture, its future and its propensity for change. Cultural change causes identity crises at a level that pits the old vs. the new; agricultural vs. industrial, industrial vs. informational that eventually ends in war. Are nations really fighting each other, or, are we fighting the end of one societal view vs. another? Given this hypothesis, McLuhan leads the reader down the chilling path of what our information society will hold in the future? The fact that he wrote this in 1968 is more prophetic now that we're entering the internet age. What conflicts will arise? How will the global economy change our perception of nations? War? Education? A tough read - but, something that will make you ponder the future.